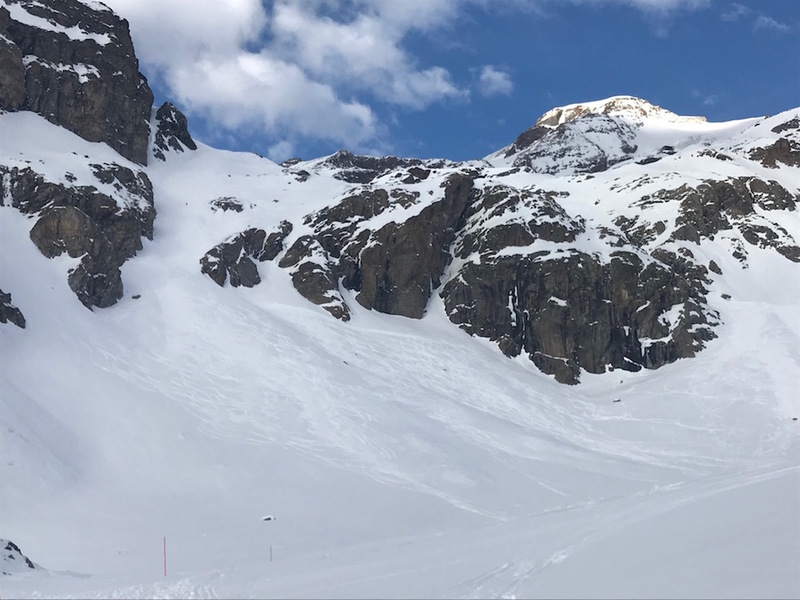 As Editor Watts reported last week, the final destination of our Aosta Valley tour took us to Champoluc and the Monterosa ski area. It’s where I’ve had some of my best off-piste adventures and memories. On the first morning, we wake up to a blue sky day and the team at Ski 2 picks us up in a mini-bus from our campZero hotel (more on this 5-star hotel in a forthcoming feature) and drives us to Ski 2 HQ in the village centre. While Editor Watts and Ski 2 co-owner Simon Brown shoot straight up the nearby gondola for a day of high-speed cruising on deserted and perfectly groomed pistes, I am taken to rent some fat off-piste skis and then to the Frachey funicular by John Arnold of Mindful Mountains my guide for the day. 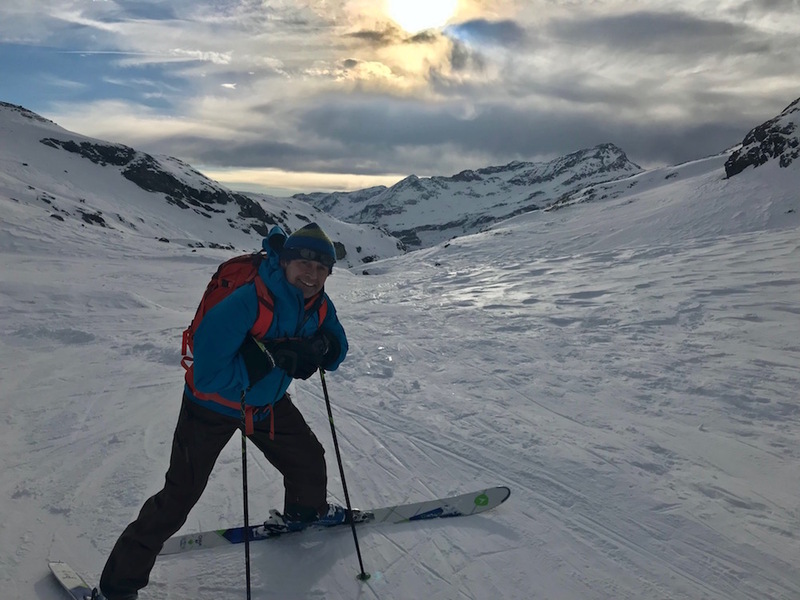 John specialises in leading and coaching off piste and all mountain skiing for all levels of skier. He also offers several courses such as Piste to Powder, ski touring and journeys skiing through the Monterosa. 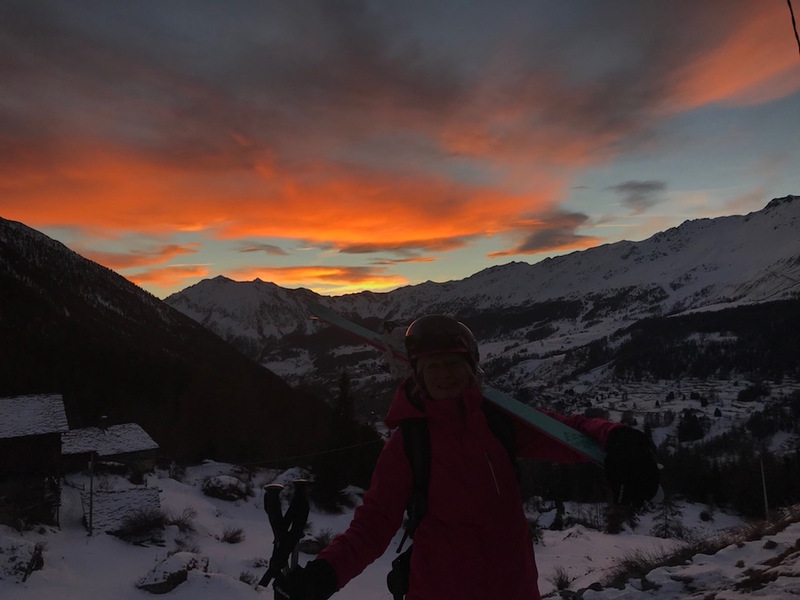 As well as having wonderful piste skiing, the Monterosa ski area is an off piste playground that includes couloirs, long top to bottom runs and stunning glacier terrain. It’s here that I ticked off a top bucket list aspiration a few years ago, which was to ski one of the longest heliski drops in the Alps: from the Col de Lys at 4200m down the epic Grenz Glacier between the Monte Rosa and Lyskamm peaks. Weaving through seracs and stunning scenery you eventually end up skirting the Gorner gletscher and on the piste at Furi in Zermatt. To return you take the cable car from Kleine Matterhorn to the slopes of Cervinia. Then it’s off piste again following a beautiful descent under the east flank of Mt. Roisetta until you reach St. Jacques back in the Ayas Valley. The lift from Frachey takes you back into the Monterosa ski area and home. I’ll never forget getting in the helicopter at Colle Bettaforca and climbing high over the tumbling glacier with the Margherita hut below clinging to a ridge on the Monte Rosa massif, and then being dropped miles from anywhere. The whole ski day is 75km. On the short and swift cable car ride to Indren at 3275m our lift companions all have freeride skis. The top of the cable car accesses a limitless off-piste area from the edge of the glacier. Purists have grumbled that well-known off-piste descents such as La Balme, which goes all the way to Alagna are now too easy to reach. But there’s more than enough terrain here for every keen freerider. Those who shared our cable car seemed to disappear and we were quickly left alone to traverse to some excellent snow and descend past the Indren glacier to our route down the Eagle couloir. Weaving in and out of some rather challenging snow, John expertly managed to find some nice pockets of powder protected from the wind. From there we headed downward past the Orestes hut to the mid station of the Salati gondola at Gabiet, making a total descent of almost 1000m. John imparts snippets of information on our journey as we drink in the magnificent views enjoying our isolation. For old times’ sake, our second run was from Passo Salati into the Olen Valley where we skied past the remains of the Guglielmina hut that burned down a few years ago. I had stayed at the hut several times. It was famed for its charismatic caretaker, Alberto, and its legendary wine cellar (more than 7,000 bottles perished in the fire). But there’s good news, John tells me, as it’s been bought and there are plans for its renovation. We skied far right into the shadows, where John managed to find a few turns of fresh snow. From there we joined the piste and skied to the base of the Alagna cablecar at Pianalunga. After a quick snack for lunch at the Bar Passo del Salati, where we were given a few anti pasta tasters by the colourful custodian Giuliano, while listening to his eclectic music choice and cheery tales, it was back up to Indren. On this run, we passed the glacier and kept high and right to enter the Grand couloir. It was a lovely long run that took us once again to the mid station of the Salati gondola at Gabiet. With daylight running out, we blasted back on the pistes, via Stafal and Colle Bettaforca until we reached a little hamlet where you can stay in the Rifugio Vieux Crest. A quick grappa later, we emerged to the setting sun. The sky was a vision of fire: reds, pinks and burning crimson. A final off-piste encounter led us across wet grass to reach the final piste home. At the end of our day John reckoned we might have skied one per cent of the off-piste possibilities. Perhaps I’ll have to join one of his off-piste courses or adventures to find out more.